Magento 2 Multi Merchant Buy Button module enables the marketplace sellers to sell products on other websites(cms or custom websites) like-Joomla, OpenCart, WordPress(blogging website) etc. This module will extend the visibility of the seller products. The seller can create a buy button for a single product as well as the collection of products. 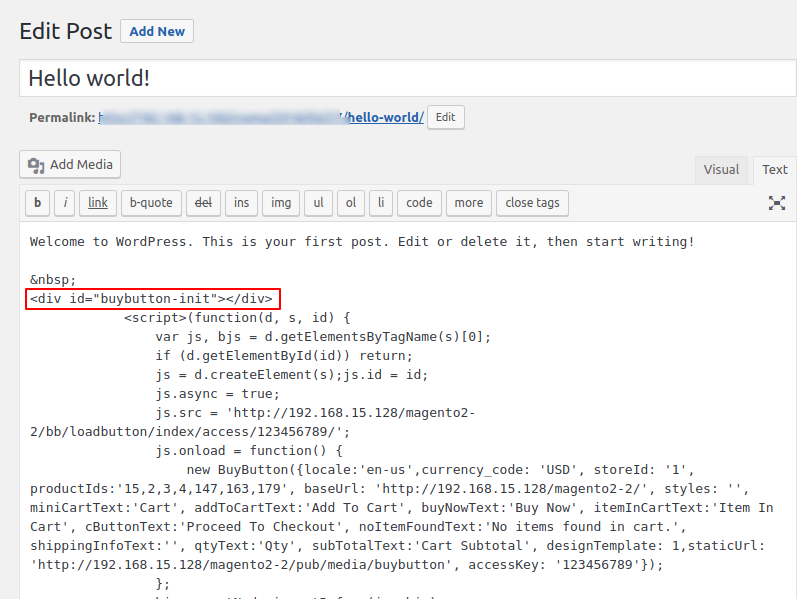 The sellers just need to copy a line of code from their Magento seller account and paste on any website. The customers will get full-featured shopping cart which let the customer checkout from any website easily. This module is a marketplace add-on. So, Magento 2 Marketplace Multi-Vendor module must be installed. The admin can create the buy button for single products and collection of products. 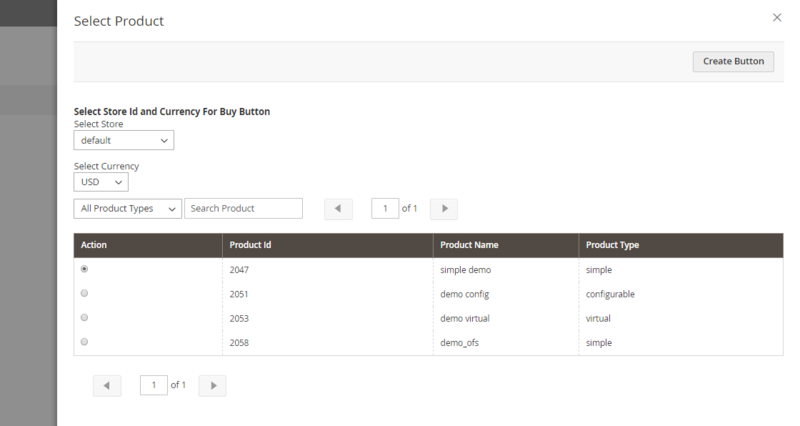 The admin can even create the buy button for single products of the sellers. The sellers can create the buy button for their single products and collection of products. The module supports simple, configurable and virtual products. All types of custom options are supported. 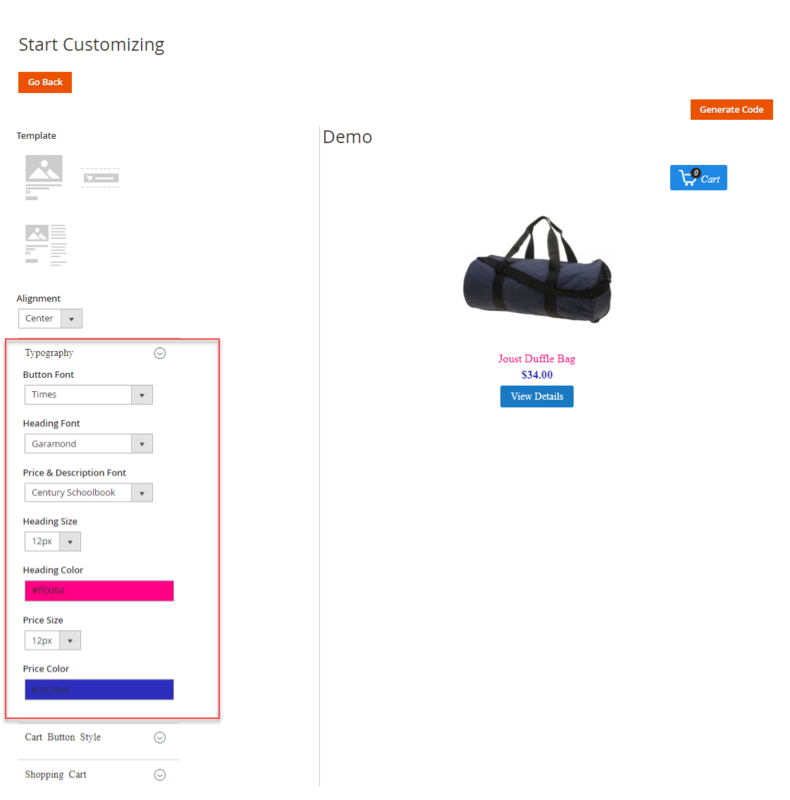 The admin and the seller can customize view(font color, button background color, radius) of the buy button. 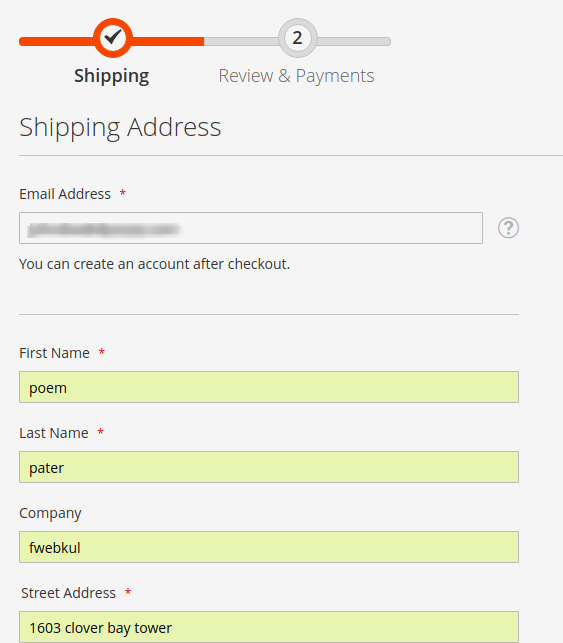 The admin and the seller can change all the static text on the buy button for each buy button. Buy Button comes with its own cart(add, remove, update all operations supported). Checkout will be done by default magento2 checkout in a popup window. The generated code can be easily embedded on any website(CMS or Custom Websites). For module translation, navigate to the following path in your system app/code/Webkul/MpBuyButton/en_US.csv. Open the file named en_US.CSV for editing as shown in the below screenshot. Then replace the words after the comma(,) on the right in the file with your translated words. After editing and translating the CSV file, you need to save the translated file name according to your region language and country code such as – de_DE.CSV. Followed by uploading the translated file to the same folder from where you have obtained it. Now your module translation is complete. After the installation, the admin will configure the module settings. 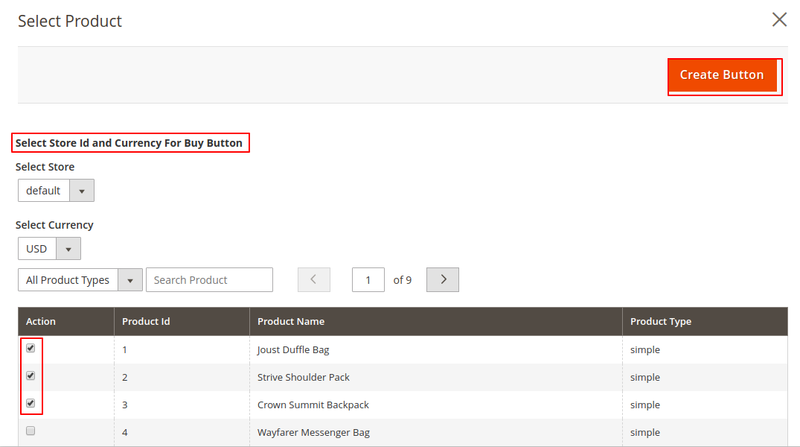 For this, the admin will navigate to Stores -> Configuration -> Webkul ->Marketplace Buy Button as shown below. Enable for Sellers – Select Yes to enable the module for the marketplace sellers. Else, select No. Now, the admin will create the “Buy” button. 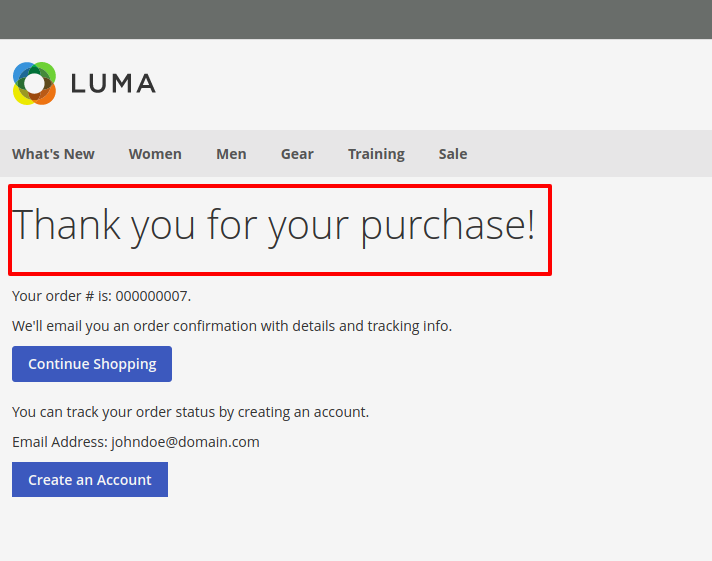 For this, the admin will navigate to Buy Button -> Create Buy Button as shown below. 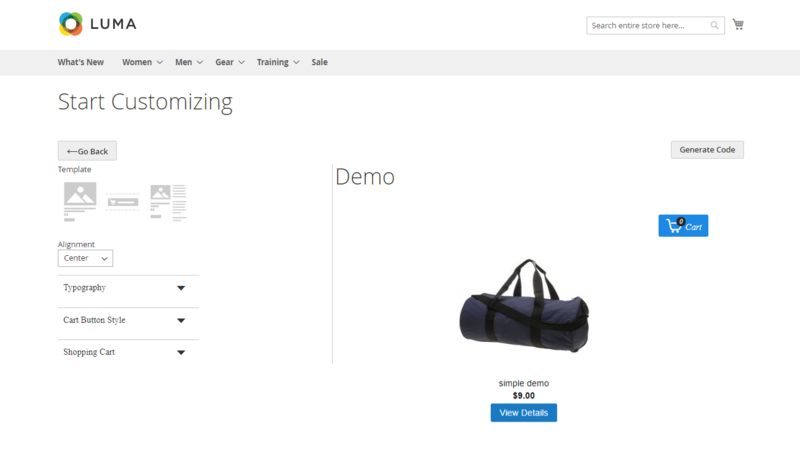 Clicking the Create Buy Button will navigate the admin to the Select Product page. 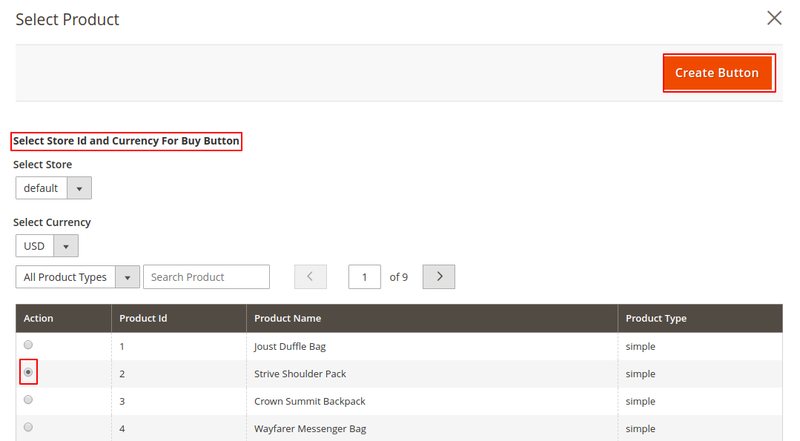 Select Product – Create the buy button for the single product of the admin. Seller Product – Create the buy button for the single product of the seller. 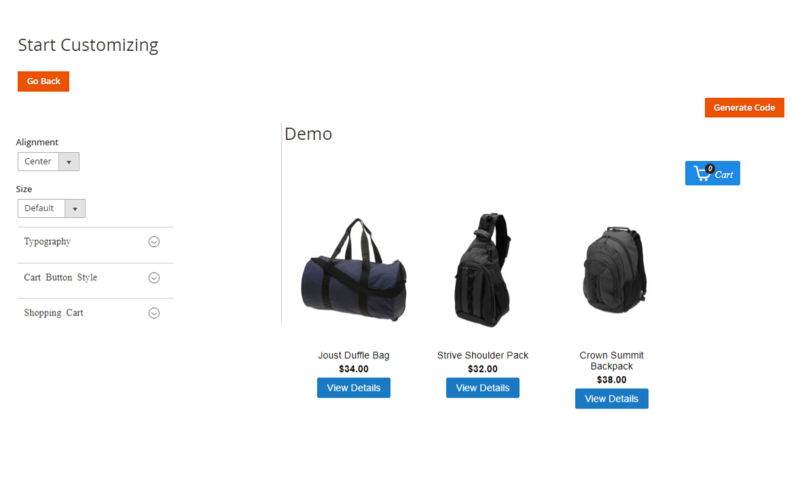 Collection Product – Create the buy button for the many products. After selecting the Single product option, the admin will get a pop-up slider as shown below. Here, the admin will select the Store, Currency, and a product. The admin can search product by the name and can filter by the product types. After this, click on Create Button which will navigate the admin to the Start Customizing page. 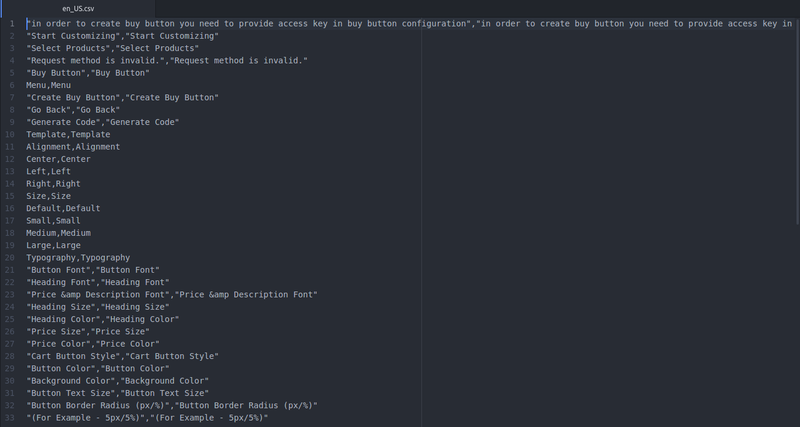 Template – Select any template for Buy button layouts. Note-Template option is available only for a single product. 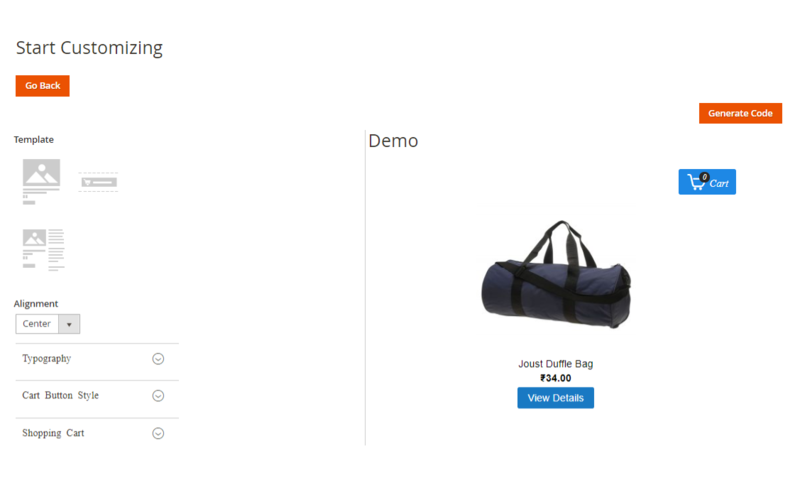 Alignment – Choose three alignments(Left, Centre and Right) of buy button layout. Typography – Choose Button Font, Heading Font, Price & description Font, Heading Size, Heading Color, Price Size, and Price Color. Cart Button Style – Change Button Text Color, Button Background Color, Button Text Size, Button Border Radius, Button Text, and View Button Text. 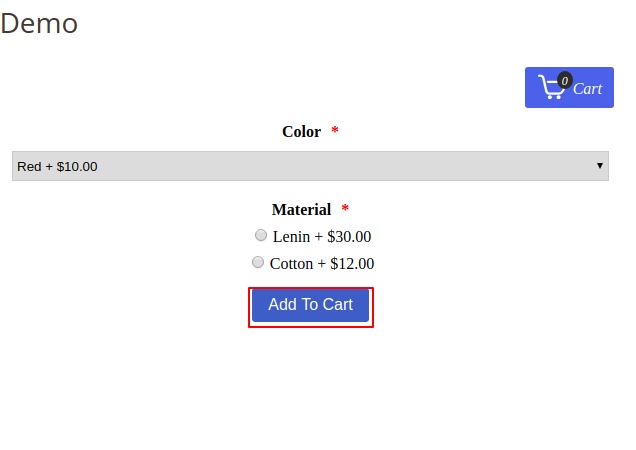 Shopping Cart – Choose Cart Heading, Text for Total, Item in Cart Text, Add to Cat Button Text, Button Color, and Background Color. After the customization, the admin will generate a code by clicking on the Generate Code button and a pop-up will appear. The admin will copy this code and paste into the source code of any website. like – Joomla, OpenCart, WordPress etc. Then, all the functionality will be embedded on that website. 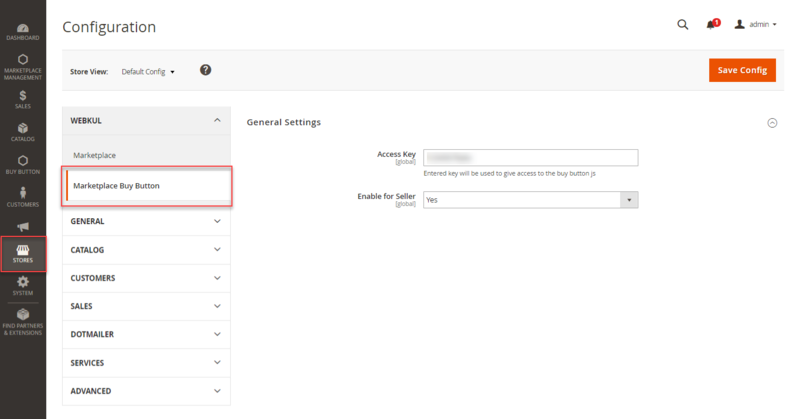 For creating the Buy Button for a single product of the seller, the admin will follow the same steps as mentioned above for single product of the admin. After selecting the Select Collection option, the admin will get a pop-up slider as shown below. Here, the admin will select the Store, Currency, and Multiple Products. The admin can search product by the name and can filter by the product types. 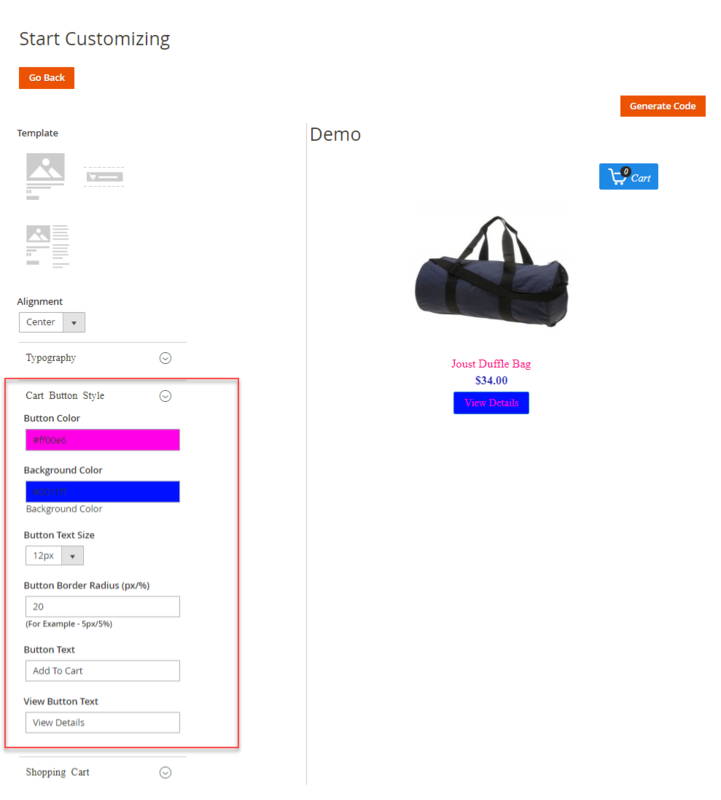 Here, the admin can customize the Buy button using the option – Alignment, Size, Typography, Cart Button Style, and Shopping Cart. After the customization, the admin will generate a code by clicking the Generate Code button. Then, copy that code and paste into the source code of any website. like – Joomla, OpenCart, WordPress etc. For creating the buy button, the seller will navigate to Buy Button -> Create Buy Button. 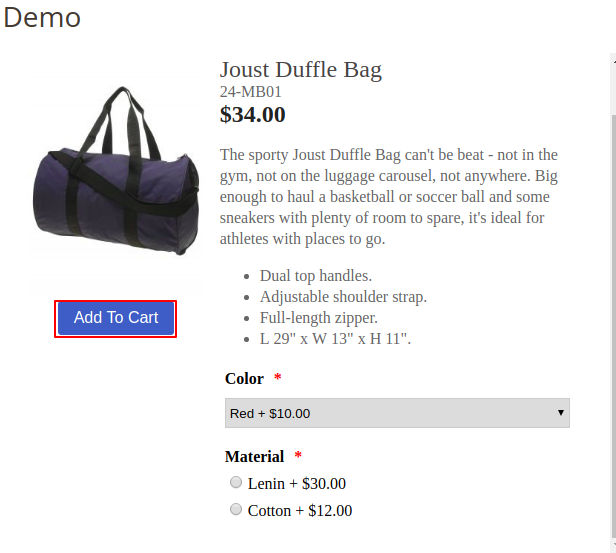 Clicking the Create Buy Button will navigate the seller to the Select Product page as shown below. 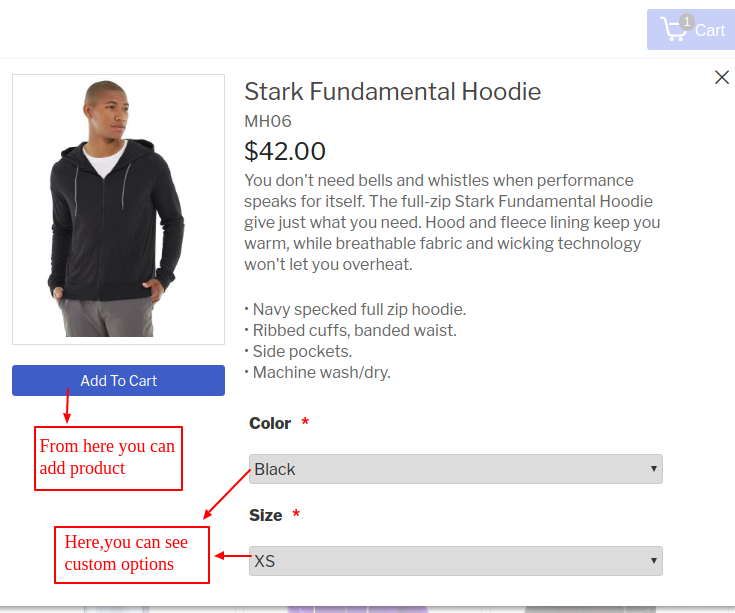 Select Product – Create the buy button for the single product. 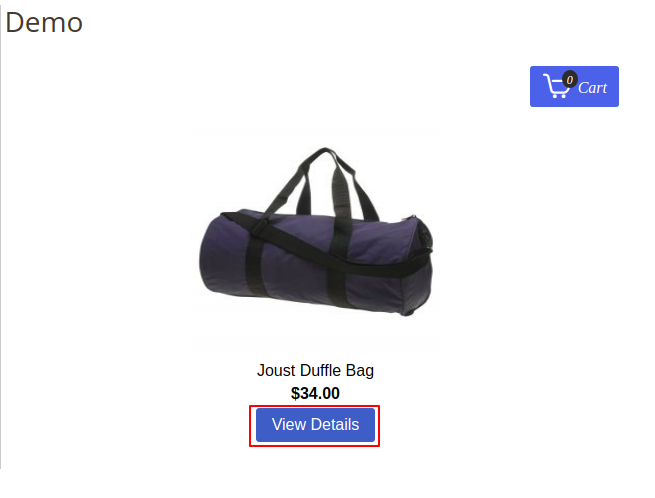 After selecting the Single product option, the seller will get a pop-up slider as shown below. Here, the seller will select the Store, Currency, and a product. The seller can search product by the name and can filter by the product types. 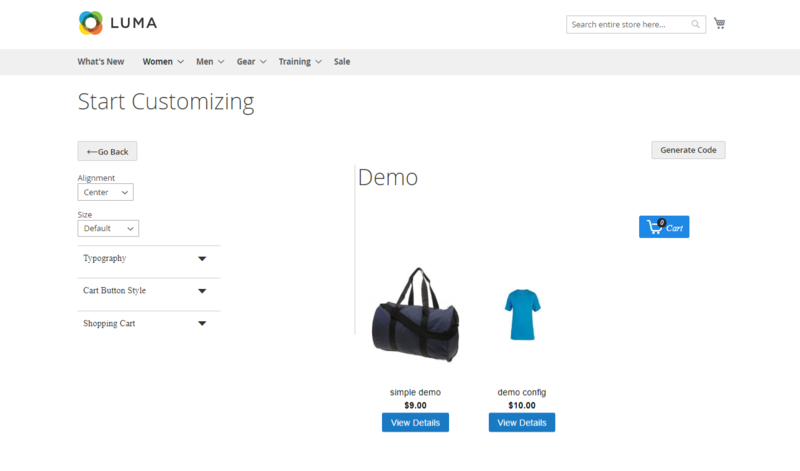 After this, click on Create Button which will navigate the seller to the Start Customizing page. 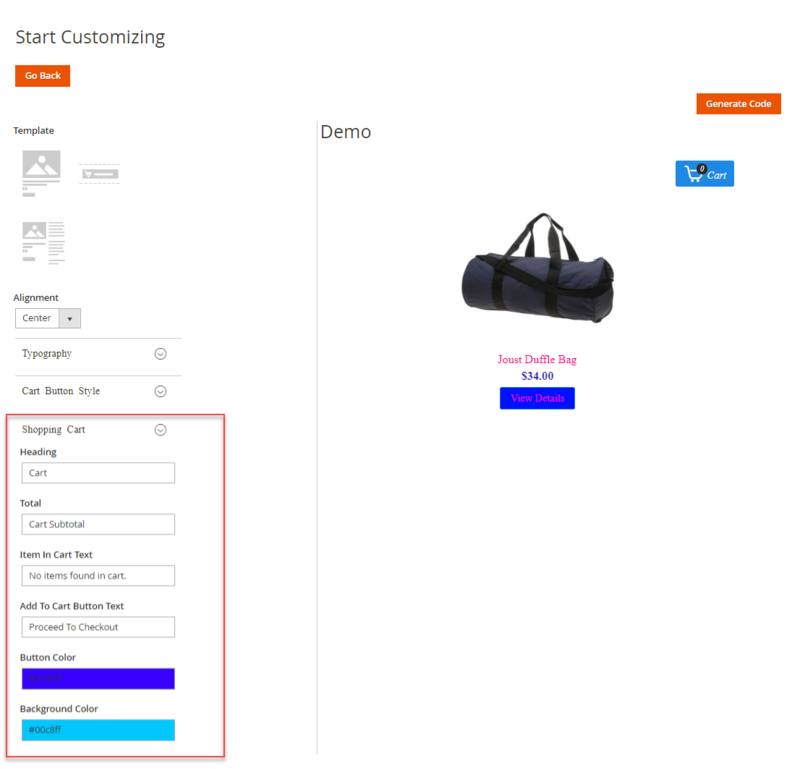 Here, the admin can customize the Buy button using the options – Template, Alignment, Typography, Cart Button Style, and Shopping Cart. 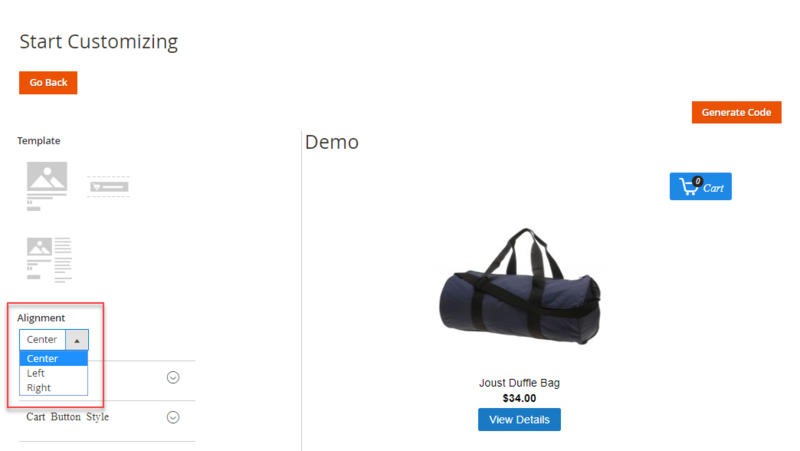 After selecting the Select Collection option, the seller will get a pop-up slider as shown below. Here, the seller will select the Store, Currency, and Multiple Products. The seller can search product by the name and can filter by the product types. The customers can add a Simple product, virtual product, and the configurable product to their shopping cart on other websites. Add all type of custom options which will be displayed on other websites as well. The customers can choose options for the configurable product. After adding the products to the shopping cart, the customer will proceed to checkout. 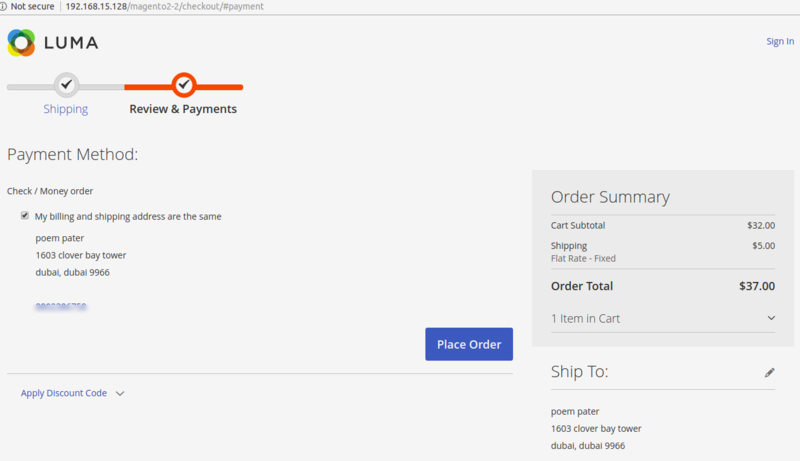 For this, the customer will click on the Cart icon and will get the “Proceed to Checkout ” button as shown below. After clicking on “Proceed to Checkout“, the customer will get a Default Magento 2 Checkout pop-up window. In the window, the customers can sign up or sig in and put their shipping address. The customer will choose a shipping method and proceed to Next. After choosing the shipping method, the customer will select the payment method. And, finally place the order successfully by clicking the “Place the Order” button. 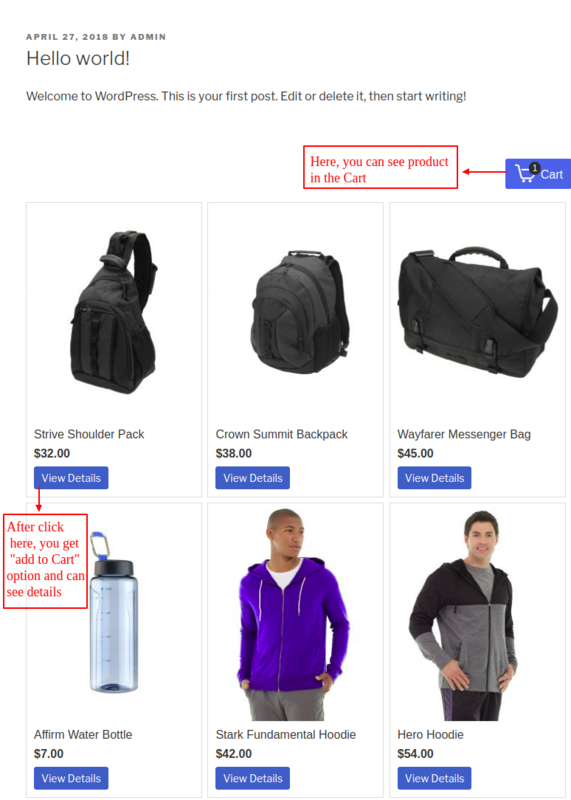 The Buy button cart is responsive for all kind of screen sizes and can adjust itself with the Mobile screen, Tablet screen, and Desktop screen.